Mama, I will thrill you yet. 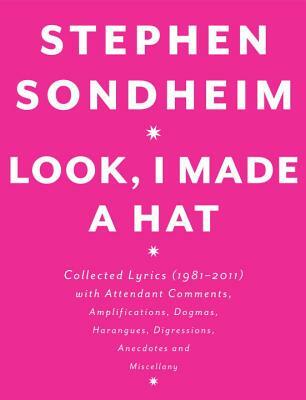 After his acclaimed and best-selling Finishing the Hat (named one of the New York Times 10 Best Books of 2010), Stephen Sondheim returns with the second volume of his collected lyrics, Look, I Made a Hat. After his acclaimed and best-selling Finishing the Hat (named one of the New York Times 10 Best Books of 2010), Stephen Sondheim returns with the second volume of his collected lyrics, Look, I Made a Hat, giving us another remarkable glimpse into the brilliant mind of this living legend, and his life’s work. Picking up where he left off in Finishing the Hat, Sondheim gives us all the lyrics, along with excluded songs and early drafts, of the Pulitzer Prize–winning Sunday in the Park with George, Into the Woods, Assassins and Passion. Here, too, is an in-depth look at the evolution of Wise Guys, which subsequently was transformed into Bounce and eventually became Road Show. Sondheim takes us through his contributions to both television and film, some of which may surprise you, and covers plenty of never-before-seen material from unproduced projects as well. There are abundant anecdotes about his many collaborations, and readers are treated to rare personal material in this volume, as Sondheim includes songs culled from commissions, parodies and personal special occasions over the years—such as a hilarious song for Leonard Bernstein’s seventieth birthday. As he did in the previous volume, Sondheim richly annotates his lyrics with invaluable advice on songwriting, discussions of theater history and the state of the industry today, and exacting dissections of his work, both the successes and the failures. Filled with even more behind-the-scenes photographs and illustrations from Sondheim’s original manuscripts, Look, I Made a Hat is fascinating and essential reading for any fan of his work.